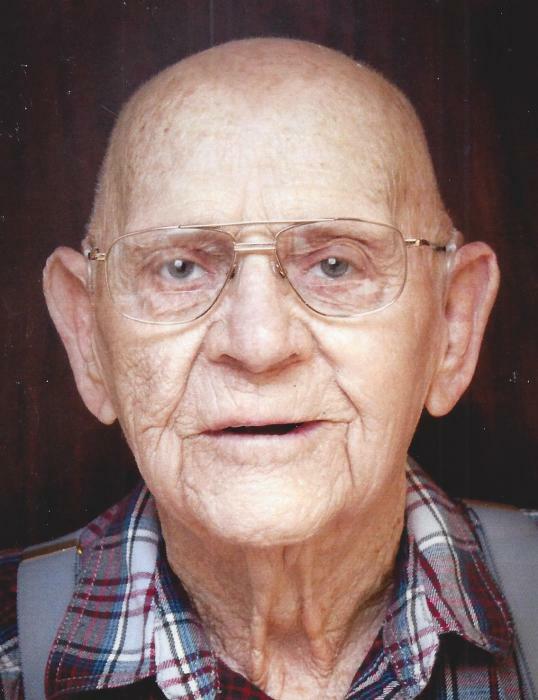 Carl Webb, 97, of Amarillo, died Friday, April 12, 2019. Graveside services will be 10:00 am Monday at Llano Cemetery Mausoleum Chapel. Carl was born August 16, 1921 in Duncan, Oklahoma to William and Katie Webb. He graduated from Goodnight High School. He married Zola Brown in Amarillo in 1941. Carl proudly served in the Army Air Corp from 1943-1945 during WWII. The couple moved to Amarillo from Pampa in 1947. Carl worked for Gilvin Terrill, Plains Creamery, and finally Pantex. He retired as development supervisor after 24 years of service. Carl and Zola enjoyed traveling in their RV in their spare time. Carl could fix or build anything. He even built several houses, most times from reclaimed wood and supplies. He was a jack of all trades. Carl was preceded in death by his parents; his wife, Zola Webb; two sisters, Lois Cook and Dona Bass; and a brother, Earl Webb. Survivors include a daughter, Sandy Durham and husband Cliff of Amarillo; three grandchildren, Shane Durham and wife Christie of Amarillo, Shawna Hanks and husband Randy of Amarillo, and Shelly Haralson and husband Dale of Ft. Worth; nine great-grandchildren; five great-great-grandchildren. The family would like to extend special thanks to the staff of the VAMC and VA Community Living Center for their attentive and loving care of Carl. The family suggests memorial donations may be made to the Veteran’s Administration, 6010 W. Amarillo Blvd. Amarillo, TX 79106.